Not sure if I want to sing Willie Nelsons' "On the Road Again" or that song, "Back in the Saddle again", maybe even…"The Wheels On the Bus" but regardless, I'm SINGING today…tone deaf ear and all. It's a Happy Day.. 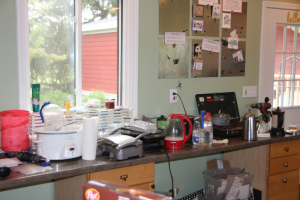 I'm heading out this afternoon to pick up that last of my cabinets and progress on my kitchen can move forward again. I've got my carpenter lined up for installation tomorrow and refrigerator is being delivered on Saturday. I am even going to play my "But it was my Birthday and Mother's Day and you didn't even get me a card" card and hope to guilt my dear hubby, Rob into working on my beams and installing my drawer pulls. A little sweat labor is a better gift than chocolates anyway! And furthermore, I even checked an old Hostess Club video off my to-do list this week. Enjoy. Make sure you get this stamp set before it's gone. It's really quite lovely. Fabulous Flora Hostess Set. I do have my Catalog Kick off this Friday and Saturday and when I set the date I imagined being a bit further along in the "reclaiming the office space endevour" and dreamed of having chairs set out of the porch for browsing etc. I might have to save that for the August Holiday Catalog Kick off. :) I'll have chocolate and catalogs, a make and take or two and new products to display…some times its best to know one's limits….of sanity, of course.